I’m HERE! With a WORKOUT! Well crap. I have just been sucking with my blog game lately. Let jump right to it. I also want to apologize to any other bloggers out there who may, on occasion, get comments from me and who are not seeing any as of late. Yeah, I have also been slacking in that department. Don’t worry, I’m still reading your blog. And obviously liking it. Just know that I am either avoiding motion sickness on the morning train or sitting on my hands to avoid peeing my pants on the bus ride home and thus cannot use my thumbs to type a quirky response to your latest and greatest published goods. And to my readers, thanks for sticking around. Because…you’re awesome. I have some posts lined up (and by ‘lined up’ I mean I haven’t typed them yet, but they’re just ideas in my head) about latest meals, a couple of recipes, and some beauty/fashion favorites. I’m thinking of calling them my beaution or feuty finds <——play on words, ya catch that? For this post, given that I am typing this at 10pm and I still have to shower and give some sort of attention to my dogs and husband, I just wanted to share with you the workout that I did tonight. I forgot that I needed to tell you about the FAB find that TYLER OF ALL PEOPLE discovered tonight. MOM…THIS IS YOUR CUE TO STOP READING THIS POST. I PROMISE YOU CAN READ IT IN 7-10 BUSINESS DAYS. So this ‘find’ if you will…..apparently lowes.ca has some sort of pricing typo and listed their Margaritaville machine on sale from $98 to $78 dollars. I’m thinking there was supposed to be a ‘1’ in front of those prices, but anyyyywaysss… Tyler found that if I went to Best Buy (where they honor competitor’s sale prices and award an ADDITIONAL 10% off) I could score that sucker for under $70! So, I Speedy Gonzalez’d it over to the Best Buy and WHAM BAM THANK YOU MA’AM I got my Mom her *belated* birthday gift FOR THE GREATEST STEAL OF ALL TIMES. So this workout consists of three sets of exercises. Ok, technically 6 sets since I separated them from ‘left’ and ‘right’. 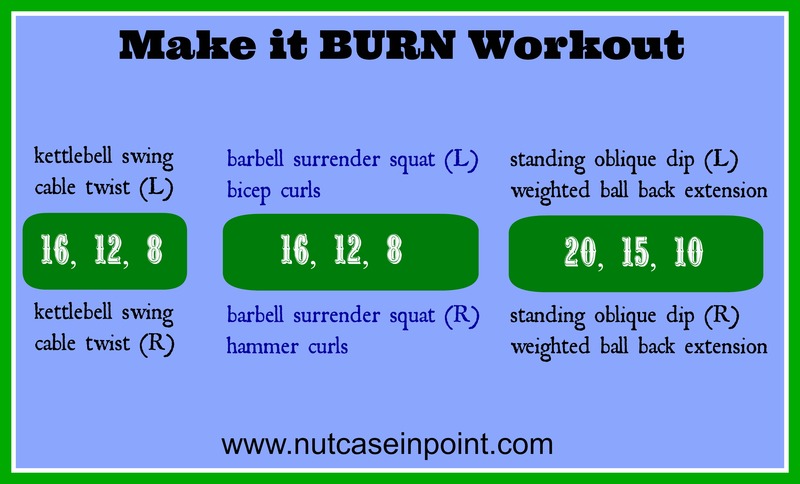 For each set, I would complete 16 reps of each move, then 12 reps of each, then 8 reps of each. Once I was completed with those 3 sets, I would move to the next three sets- which were essentially the same moves, just on the other ‘side’ (so this would be the moves from column one in the pic below) Then I move to the next column and do the same, 16 of both, 12 of both, 8 of both, then onto the bottom set: 16, 12, 8. Last column was 20, 15, and 10 of each move. After I did this, I completed 20 minutes of HIIT and rolling hills on the bike. And when I got in my car to go home, I couldn’t even lift my leg to the gas pedal because of squishy-post-workout leg syndrome. I really can’t wait to see if I can manage a pair of heels to work tomorrow. And as Merritt Wever so perfectly said it at the Emmy’s last night…Umm..I gotta go, bye. this looks like a great workout! now that i’ve cut back on my teaching and have more time for MY workouts, i’m always looking for new strength training ideas!